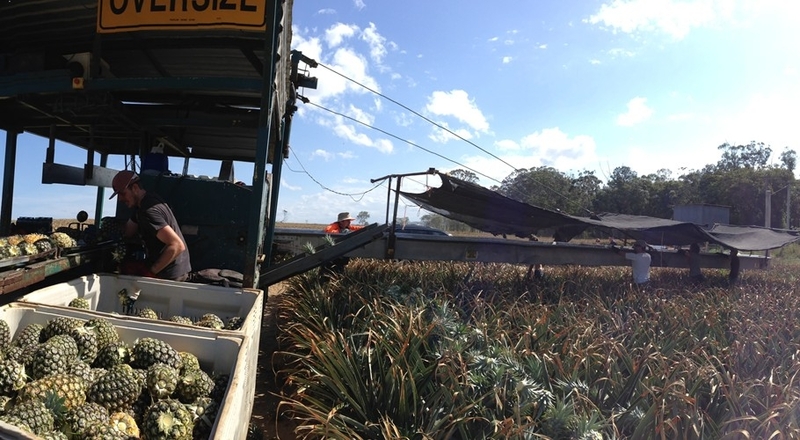 Wamuran, in Queensland’s Moreton Bay region, is ideal for pineapple production because it is 58 metres above sea level and has warm, frost-free winters and loamy soils – perfect for producing sweet pineapples 10 months of the year. Wamuran is a traditional pineapple growing region with ideal conditions. The Sunshine Coast is renowned worldwide as Australia’s traditional pineapple-growing territory. At its heart is Wamuran, where the Scurr family has been growing pineapples since the 1960s. Another grower in this district also produces pineapples for Piñata Farms. More than 6.5 million plants are cultivated on 10 farms spanning 140 hectares in the foothills of the iconic Glasshouse Mountains. Since introducing hybrid variety MD2 to Australia from Hawaii, fresh pineapple production has become Piñata’s focus. Both the MD2 and 73-50 varieties are the most widely grown. Production at Wamuran spans February to November with peaks from February to June, and September to November. The packing shed at the home farm has the capacity to handle up to 3,000 trays a day. As pineapples flower in the cooler months, beds are raised for warmth and drainage. On average, Wamuran receives 1846mm of rain a year, so irrigation is not needed. Typically, summers are wet so production at this time is replaced by crops from northern regions. At Wamuran, it takes each plant up to two years to develop its first fruit. A second follows about 18 months later. Once spent, plants are mulched into the ground and, after six months, pineapple tops are planted to create the next generation.